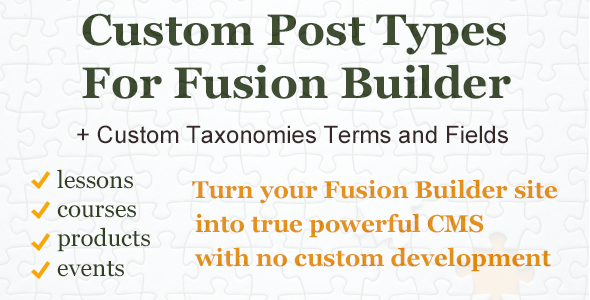 Custom Post Types and Taxonomies is a WordPress plugin for the Fusion Builder, used by Avada theme. The default functionality of the Fusion Builder allows to work only with WordPress built-in post types like blog posts or with Avada built-in post types like portfolios. This plugin extends the Fusion Builder Blog, Portfolio and Recent Posts elements to work with any custom post types (CPTs). Blog and Recent Posts elements are also extended to work with custom taxonomies and custom fields. The Fusion Builder has the Blog and Recent Posts elements to show your blogs using different styles and layouts. It also has Portfolio element to show Avada’s portfolios. The plugin creates 3 new elements similar to Blog, Recent Posts and Portfolio elements and adds several new options to it. These options allow to use any custom post types instead of the default ones. This means that you can put any content on any place in the page using the same styles and format like in blogs, recent posts and portfolios. This opportunity will turn your blog site into the real Content Management System. For example, if you have some events or e-learning plugin, you have custom post types created by that plugin. Now if you want to show all your events or lessons using the same styles and layouts as you have for blogs or portfolios you need to use this plugin and select the “event” post type instead of the “post”. This plugin also adds features to filter CPTs by custom taxonomies and show custom taxonomies (like categories) with your events, lessons, or other CPTs. Blog and Recent Posts elements starting from version 5.5 have the option to show custom fields like it shows meta info. 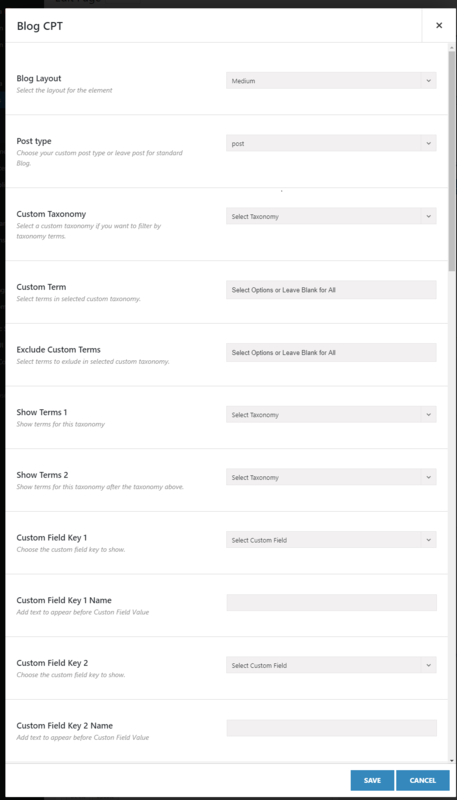 You can show max 2 taxonomies and 2 custom fields at the same time for one entry. Please see the demo to see how it may look like. Keeps all the other features of the Fusion Builder Blog, Portfolio and Recent Posts elements. After installing the plugin, create a new Page or go to modifying the existing one. Make sure that Fusion Builder is used to edit a Page. Go to the Elements menu of the Fusion Builder and choose either Bog CPT, Recent Posts CPT or Portfolio CPT. If you do not see that elements make sure they are enabled in Fusion Builder -> Settings menu. Bog CPT, Recent Posts CPT or Portfolio CPT have configuration options similar to the original elements but have additional options to work with custom post types, taxonomies and fields. Find the Blog CPT or Recent Posts CPT in the Fusion Builder Elements Menu. It will be next to the original elements. Add element to your page, open element properties and look for the “Post type” option. Here you can choose the custom post type (CPT) you want to show. The plugin will show you the list of all installed CPTs. After choosing the post type you may save the element, then save the page and see the plugin in action. You will get all your chosen CPT entries. You may filter the output similar to filtering blogs by categories. In the Custom Taxonomy field choose the taxonomy you want to filter by. In the Custom Terms choose the Terms you want to be filtered. Custom Taxonomy field shows only the Taxonomies linked to the CPT selected in the option above. You can do the same with Exclude Custom Taxonomy Terms. The difference is that entries with the selected Terms will be excluded from the output content. You can also show Terms for custom taxonomies the same way as you show categories and tags for blogs. Similar to how you can show both categories and tags for blogs you can choose any two custom taxonomies from the Show Term 1 and Show Term 2 options. Along with Terms you can show two Custom Fields. You can also assign nice names for your custom fields. For example, if you have a custom field called product_price you can select it in the Custom Field Key 1 option and put ‘Product price’ in Custom Field Key 1 Name option. 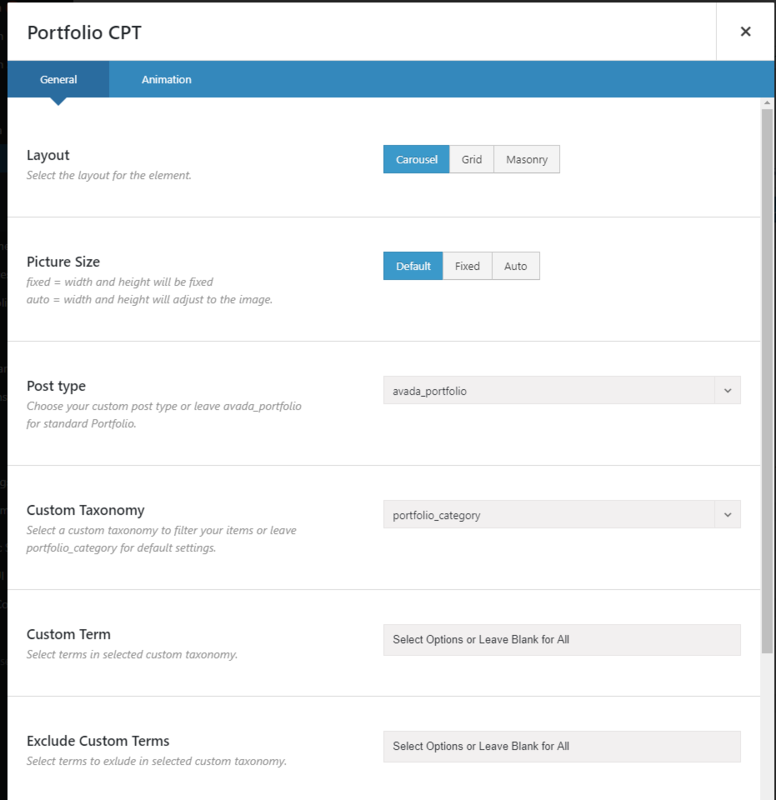 Find the Portfolio CPT in Select Element Menu. It will be next to the original Portfolio element. Add element to the page and open its options. Similar to the Blog CPT element, you may choose any installed custom post type and taxonomy instead of avada_portfolio post type and portfolio_category taxonomy. Also, you may filter you CPT by custom terms, the same way you do it for portfolio category. To receive the quick support please send us the question either via the contact form from our website of by e-mail to support@amunet.biz.